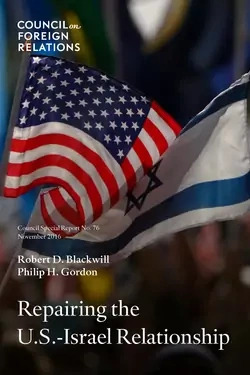 "The U.S.-Israel relationship is in trouble," warn Council on Foreign Relations Senior Fellows Robert D. Blackwill and Philip H. Gordon in a new Council Special Report, Repairing the U.S.-Israel Relationship. Significant policy differences over issues in the Middle East, as well as changing demographics and politics within both the United States and Israel, have pushed the two countries apart. Blackwill, a former senior official in the Bush administration, and Gordon, a former senior official in the Obama administration, call for "a deliberate and sustained effort by policymakers and opinion leaders in both countries" to repair the relationship and to avoid divisions "that no one who cares about Israel's security or America's values and interests in the Middle East should want." "For strategic, historical, and moral reasons, both governments should do all they can to reframe and revive the U.S.-Israel strategic partnership," the authors argue. "The upcoming transition to a new administration provides an opportunity to put recent disagreements aside and to show the political will needed to reverse the negative policy trends described," write Blackwill and Gordon. Reframe the strategic relationship. Invite the Israeli prime minister to Camp David in early 2017 for a summit "focused on developing a new strategic vision for a changing Middle East, committing the United States to remain engaged in the region, systemically addressing the Palestinian problem and institutionalizing an intensive bilateral strategic dialogue." Extend and expand defense cooperation. "Enhance Israel's sense of security and confidence in the United States by committing to expanded missile defense, anti-tunnel, and cybersecurity cooperation under the terms of the September 2016 long-term defense assistance Memorandum of Understanding." Focus on making the Iran nuclear deal work. "Move beyond the debates about the merits of the Iran nuclear deal and work together to implement and rigorously enforce it, with a commitment to imposing penalties on Iran for noncompliance and a joint plan for preventing Iran from developing nuclear weapons after the deal's main restrictions expire." Contain Iran's regional designs. Develop and implement a coordinated U.S.-Israel approach to address the regional challenges posed by Iran. Implement steps to improve Palestinian daily life and preserve prospects for negotiated peace. "Agree on a set of specific, meaningful measures that Israel will take unilaterally to improve Palestinian daily life and preserve prospects for a tw0-state solution, linking continued U.S. willingness to refrain from or oppose international action on Israeli settlements or the peace process to Israel's implementation of such positive, concrete steps." Rebalance the partnership by expanding economic cooperation. Expand economic cooperation focused on bilateral trade, investments, energy, innovation, and Israel's integration into the region. Blackwill and Gordon argue that this mutually important partnership can be preserved, but only if leaders and publics on both sides honestly acknowledge the challenges and take meaningful steps to address them. Blackwill was formerly deputy assistant to the president, deputy national security advisor for strategic planning, and presidential envoy to Iraq under President George W. Bush, and U.S. ambassador to India from 2001 to 2003. Gordon served as special assistant to President Barack Obama and White House coordinator for the Middle East, North Africa, and the Gulf Region from 2013 to 2015, and as assistant secretary of state for European and Eurasian affairs from 2009 to 2013.